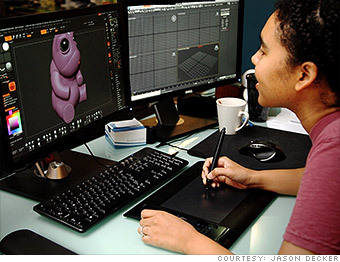 Videogame designer? Wind turbine engineer? These 6 cutting-edge jobs offer great growth potential and solid pay. What they do all day? From scoring to rulemaking, designers define how a game is played. They focus on a title's core systems and guide it through production, often fiddling with prototypes up until the last minute, to ensure the complicated infrastructure they've built strikes a balance between fun and playability. How to get the job? The only way to get respect is to have a range of original games that communicate your values as a designer, says Dustin Clingman, executive director of the International Game Developers Association. "You should be actively making games all the time," he says. What makes it great? Creating games is just plain fun, and the field is very kinetic. Best of all, designers get to see their creative vision played and enjoyed by others. What's the catch? The designer role is the crown jewel in the games industry, and competition is fierce. The field of candidates includes not only designers but also programmers and other technical specialists looking to transition into this coveted job. Note: Median pay is for an experienced worker (at least five to seven years in field). Job growth is estimated for 2010-20, and based on people working in broader 'job family' from the Bureau of Labor Statistics. For detailed methodology, see How We Picked the Best Jobs.